Waringstown have beaten off stiff competition to collect the prestigious Belfast Telegraph Team of the Year accolade. The Mid-Ulster side got the nod ahead of the NI Commonwealth Games Team, Slaughtneil Camogie Team, Chloe Watson and Sandra Bailie. "It was a great honour to receive the Belfast Telegraph Sports Team of the year Award last night." 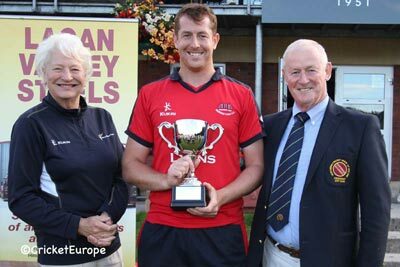 Waringstown captain Greg Thompson told CricketEurope. "It was the second time in two years that we’ve been nominated and to come out on top this year, especially considering the quality of the other nominees is a real privilege and will act as motivation to a hungry squad to do everything in our powers to replicate last year’s achievements." Waringstown lifted four trophies in 2018, replicating their feat of 2017, including back-to-back Irish Senior Cups.